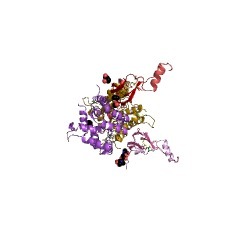 This cysteine rich domain is found in multiple copies in GNDF and GAS1 proteins. GDNF and neurturin (NTN) receptors are potent survival factors for sympathetic, sensory and central nervous system neurons (PUBMED:16551639), (PUBMED:9192899). GDNF and neurturin promote neuronal survival by signaling through similar multicomponent receptors that consist of a common receptor tyrosine kinase and a member of a GPI-linked family of receptors that determines ligand specificity (PUBMED:9192898). 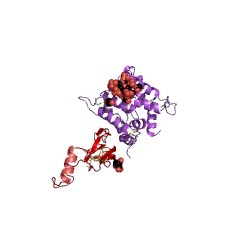 This cysteine rich domain is found in multiple copies in GNDF and GAS1 proteins. GDNF and neurturin (NTN) receptors are potent survival factors for sympathetic, sensory and central nervous system neurons [(PUBMED:16551639), (PUBMED:9192899)]. GDNF and neurturin promote neuronal survival by signalling through similar multicomponent receptors that consist of a common receptor tyrosine kinase and a member of a GPI-linked family of receptors that determines ligand specificity [(PUBMED:9192898)]. There are 7226 GDNF domains in 2899 proteins in SMART's nrdb database. Taxonomic distribution of proteins containing GDNF domain. This tree includes only several representative species. The complete taxonomic breakdown of all proteins with GDNF domain is also avaliable. Click on the protein counts, or double click on taxonomic names to display all proteins containing GDNF domain in the selected taxonomic class. Gas1 is related to the glial cell-derived neurotrophic factor familyreceptors alpha and regulates Ret signaling. The growth arrest-specific gene 1 (Gas1) protein has been proposed tofunction during development as an inhibitor of growth and a mediator ofcell death and is also re-expressed in adult neurons during excitotoxicinsult. Here we have demonstrated that the Gas1 protein shows highstructural similarity to the glial cell-derived neurotrophic factor (GDNF)family receptors alpha, which mediate GDNF responses through the receptortyrosine kinase Ret. We found that Gas1 binds Ret in a ligand-independentmanner and sequesters Ret in lipid rafts. 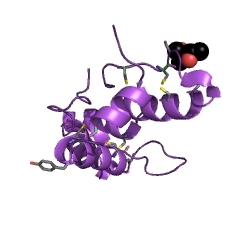 Signaling downstream of Ret isthus modified through a mechanism that involves the adaptor protein Shc aswell as ERK, eventually blocking Akt activation. Consequently, when Gas1is induced, Ret-mediated GDNF-dependent survival effects are compromised. GFRalpha3 is an orphan member of the GDNF/neurturin/persephin receptorfamily. GDNF, neurturin, and persephin are transforming growth factor beta-relatedneurotrophic factors known collectively as the GDNF family (GF). GDNF andneurturin signal through a multicomponent receptor complex containing asignaling component (the Ret receptor tyrosine kinase) and either of twoglycosyl-phosphatidylinositol-linked binding components (GDNF familyreceptor alpha components 1 and 2, GFRalpha1 or GFRalpha2), whereas thereceptor for persephin is unknown. 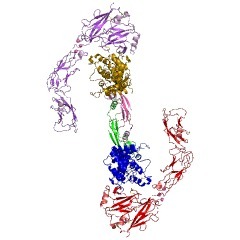 Herein we describe a third member ofthe GF coreceptor family called GFRalpha3 that is encoded by a genelocated on human chromosome 5q31.2-32. GFRalpha3 is not expressed in thecentral nervous system of the developing or adult animal but is highlyexpressed in several developing and adult sensory and sympathetic gangliaof the peripheral nervous system. GFRalpha3 is also expressed at highlevels in developing, but not adult, peripheral nerve. GFRalpha3 is aglycoprotein that is glycosyl-phosphatidylinositol-linked to the cellsurface like GFRalpha1 and GFRalpha2. Fibroblasts expressing Ret andGFRalpha3 do not respond to any of the known members of the GDNF family,suggesting that GFRalpha3 interacts with an unknown ligand or requires adifferent or additional signaling protein to function. Neurturin responsiveness requires a GPI-linked receptor and the Retreceptor tyrosine kinase. Neurturin (NTN) is a recently identified homologue ofglial-cell-line-derived neurotrophic factor (GDNF). Both factors promotethe survival of a variety of neurons, and GDNF is required for thedevelopment of the enteric nervous system and kidney. GDNF signals througha receptor complex consisting of the receptor tyrosine kinase Ret and aglycosyl-phosphatidylinositol (GPI)-linked receptor termed GDNFR-alpha.Here we report the cloning of a new GPI-linked receptor termed NTNR-alphathat is homologous with GDNFR-alpha and is widely expressed in the nervoussystem and other tissues. By using microinjection to introduce expressionplasmids into neurons, we show that coexpression of NTNR-alpha with Retconfers a survival response to neurturin but not GDNF, and thatcoexpression of GDNFR-alpha with Ret confers a survival response to GDNFbut not neurturin. Our findings indicate that GDNF and neurturin promoteneuronal survival by signalling through similar multicomponent receptorsthat consist of a common receptor tyrosine kinase and a member of aGPI-linked family of receptors that determines ligand specificity. A GPI-linked protein that interacts with Ret to form a candidate neurturinreceptor. Glial-cell-line-derived neurotrophic factor (GDNF) and neurturin (NTN) aretwo structurally related, potent survival factors for sympathetic, sensoryand central nervous system neurons. GDNF mediates its actions through amulticomponent receptor system composed of a ligand-bindingglycosyl-phosphatidylinositol (GPI)-linked protein (designatedGDNFR-alpha) and the transmembrane protein tyrosine kinase Ret. Incontrast, the mechanism by which the NTN signal is transmitted is not wellunderstood. Here we describe the identification and tissue distribution ofa GPI-linked protein (designated NTNR-alpha) that is structurally relatedto GDNFR-alpha. We further demonstrate that NTNR-alpha binds NTN (K[d]approximately 10 pM) but not GDNF with high affinity; that GDNFR-alphabinds to GDNF but not NTN with high affinity; and that cellular responsesto NTN require the presence of NTNR-alpha. Finally, we show that NTN, inthe presence of NTNR-alpha, induces tyrosine-phosphorylation of Ret, andthat NTN, NTNR-alpha and Ret form a physical complex on the cell surface.These findings identify Ret and NTNR-alpha as signalling andligand-binding components, respectively, of a receptor for NTN and definea novel family of receptors for neurotrophic and differentiation factorscomposed of a shared transmembrane protein tyrosine kinase and aligand-specific GPI-linked protein. 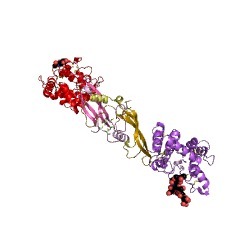 2v5e The structure of the GDNF:Coreceptor complex: Insights into RET signalling and heparin binding.